Hokies and Thundering Herd fans pay attention to Blacksburg while literally everyone else watches conference championship games. Back in August, I doubt many Virginia Tech fans had this scenario in mind. The Hokies playing at noon on a rainy December afternoon against Marshall to become bowl eligible. And yet, it's happening. The Hokies (5-6, 4-4) will take to the frozen tundra in Blacksburg against the Thundering Herd (8-3, 6-2). It's the first December home game since 2001. With a Virginia Tech victory, the bowl streak will tick ahead one more season. With a loss, the counter will roll back to zero. For the first time all season, freshman players were made available to the media during the week. Dax Hollifield was the first man at the podium. Hollifield walked into the press room jokingly saying that he hadn't done an interview in a long time. He didn't show any rust. With not even a full season under his belt, Hollifield has already won over the Hokie Nation.Moments like gesturing for UVA quarterback Bryce Perkins to get off the field have done the trick. However, he's also turned into a dependable player for Bud Foster. With 50 total tackles, Hollifield ranks fourth-best for Foster's unit. For the defensive coordinator, Hollifield is special. They got extremely close during the recruiting process, and it's the relationship with Foster that brought Hollifield to Blacksburg. "He's just my guy," explained Hollifield. "He always was telling me all the time, 'Dax, you're my guy'. And that really meant something to me. I knew he was going to take care of me, he wasn't going to tell me any lies. I trusted him more than anybody else, to be honest with you. He's a lot like my dad. I'm really close with my father. He reminded me a lot of my dad, and he's someone I can really trust. I love the man. He's the reason I came here, to be honest with you." When it came time to make his college decision in February of 2017, Hollifield had some fun with his future coach. Hollifield regaled the media with his tale on Tuesday. "So, the night before, not going to lie, I didn't know where I was going," explained Hollifield. "The night before, he was telling me, 'Dax, if you go to Clemson, I don't know what I'm going to do. I might come down there and just yank you by the daggum neck.' or something like that. So I was like 'Okay!' and then that next morning I told my high school coach, 'I'm going to get Coach Foster'. Because that's the guy I wanted to call and tell I was committing. So I acted like I was going to tell him I'm sorry and I just can't and I was going somewhere else. So I acted like that and tried to make it seem like I was going somewhere else. But at the end, I got to break it to him that yeah, I'm coming to Tech. It was pretty funny. I had him. About gave him a heart attack." For as much emotion Hollifield shows on the football field, it might come as a surprise that football isn't his favorite sport. He's more of a basketball guy. "I like basketball more than football," said Hollifield. "No lie. That's my favorite sport. I love basketball. I would dive on the floor, I swear if I played basketball, everybody would be slipping and sliding everywhere because I'm all over the floor. I usually get really sweaty. That's probably the only thing that gets me juiced a little more than football is basketball. I love basketball." Maybe Buzz Williams could take advantage of Hollifield's willingness to dive on the floor. Hollifield also addressed the fact that he isn't the only basketball player on the football team. Tre Turner is the other. "Oh yeah, I'd dub him," exclaimed Hollifield. "I'd give him a dub. I promise. I used to be like that. Not anymore though." Turner's response? You won't believe what he said. Hollifield isn't the only true freshman making an impact in Blacksburg. Turner has evolved into the third-best receiver for Virginia Tech. At least based on raw receiving yardage (396 yards). But when it comes to the intangibles, the thing coaches say they can't teach, Turner has those and others don't. He's pulled off some freakishly athletic plays in his short time donning the maroon and orange. But just like Hollifield, Turner is a basketball guy. His older brother, P.J. Hairston, played college ball at North Carolina and in the NBA for the Charlotte Hornets. Turner's path to Virginia Tech was not straightforward. For most of his high school days, basketball was Turner's main sport. It wasn't until much later on that Turner turned his attention to the gridiron. "I didn't really focus on football at all," said Turner. "I started playing in eighth grade, and I played quarterback. Then, freshman year came, I went to two summer workouts and I didn't want to play anymore but my knee was also messed up. So I didn't play that year, I played basketball. Then sophomore year, I chose to come back out because the football coach was bugging me every day in the hallway just trying to get me to play. He was trying to get me to play every single day so I came back and I didn't really start focusing more on football until around my junior year. That's when more of the offers started rolling in and I started to get more notice nationally and on a bigger scale. So I guess whenever all that happens, you pretty much have a choice to make." Despite the late start, Turner was ranked the No. 34 wide receiver according to the 247Sports Composite,Virginia Tech's highest-rated offensive recruit in the 2018 class (0.9273). His recruiting process had some memorable bumps along the trail as well. "When we recruited him, Charley [Wiles] did a great job of identifying and all that kind of stuff just who the kid was and what we were looking for," explained wide receivers coach Holmon Wiggins. "We felt like he was a mirror image of Isaiah Ford, basketball background guy that played the ball well. I got a chance to see it, through him working out, in games, I got a chance to basically sit there and see it and say 'you know what, this kid has some stuff that just can't be taught'. Now, he was a little raw, you know. Because football was a little new to him. He thought he'd probably go to the league in basketball. Then, we'd had a few hiccups. We had an elite day here when some of our young guys that we recruited and were committed had a chance to come work out with us. He kind of made me look like a liar a little bit. He comes in and we're sitting there coaching up guys and all this kind of stuff. I think the drive [to Blacksburg], he was tired and hungry, he came there and he looked awful. He dropped every pass and the head guy is looking at me like 'what the hell are you bringing? This is the guy you're talking about going to the next best thing?' I said, 'Coach, I think he was just a little off that day.'" Now to circle back to the basketball, because that's obviously what everyone is here for. Tuner fired back when he heard what Hollifield had to say. "That's just a negative," said Turner "Dax is a bigger guy, so he couldn't really keep up with me if we played one-on-one. I probably would beat him 10-0." Let's ignore the fact that Turner apparently plays to 10 in pickup. It might be fun to see those two duke it out on the court, but it should be saved until after the season is over. The youngsters, in under a year, have turned into serious weapons for Tech. No freak injuries please. Turner and Hollifield are a bright light shining through a season full of darkness, gloom, and doom. That's something Hokies fans can be excited about. Slowly but surely, the Hokies have adjusted to their injury woes. The final depth chart of the regular season lists four of the eight defensive linemen as redshirt-freshman. Two are redshirt-sophomores. Hokie Nation held their breath, again, when Emmanuel Belmar limped off the field against Virginia. Belmar had already missed the Pittsburgh game with an undisclosed injury. He wasn't on the sideline for long last Friday though, and had the game-sealing fumble recovery. "This time of the season, everybody is beat up," said Belmar. "Everybody has bumps and bruises, but you know, we got to fight through it. Because we've got to make this bowl game. ... Every week, [I'm] just fighting through practice but every single game I feel like I'll go out there and feel 100%. Still competing at my best level. I feel like it hasn't been affecting me throughout the game." The line 'everybody is a little hurt at this point in the season' was a common theme on Tuesday. "This time of year, with your football team, you have guys that are fighting through bangs and bruises and ankle sprains," said Foster. "Like i mentioned the other day, you've got a guy, I've got tremendous respect for Bryce Watts, how he's playing coming back a couple weeks after a broken arm and major surgery and things of that nature. I think it makes a statement about those guys how important this football team is and their teammates are to them. It showed in their display of their effort the other day." Foster remarked on how important Belmar has been. The redshirt-sophomore slid into the starting role at defensive end after Houshun Gaines tore his ACL. "Well, Emmanuel gives us some experience there," said Foster. "Because all the other guys, right now, are all redshirt-freshman. Or freshman, like with Eli Adams, who played a little bit in the game the other day. With [Belmar] and that particular unit, he's a guy that can be that mentor, can be that role model, can be that guy as far his day-to-day approach and his preparation and how he handles his business. That's kind of what I'm counting on him. He's one of those guys. He's a hardnose, rugged guy. Is he the most athletic guy of that group? No. But is he one of the hardest, if not the hardest working guy out of that group. Yes. That's the example he needs to set. Because if he has some guys there that, like I really think a guy like TyJuan Garbutt has tremendous upside, if he can come to work and approach it the same way that Emmanuel comes to work, then TyJuan, the sky's the limit in my opinion in where he can go with his abilities. But Emmanuel is a guy that kind of sets the standard for that, as far as the mindset and his approach to how he works every day." What has Marshall accomplished so far this season? The Thundering Herd come into this contest on a three-game winning streak, and have won five out of the last six. Marshall even beat Old Dominion in Norfolk, which is apparently something that's allowed. Who knew. Their defense isn't one to sneeze at. Nationally, Marshall has the fourth-best 3-and-out percentage (42.6%), sixth-most sacks per game (3.27), the sixth-best rush defense (100.45 yards/game), and the 23rd-best scoring defense (20.3 points/game). Virginia Tech's offense will need to be operating smoothly for all four quarters. The Hokies can't afford to go silent in the third quarter again. 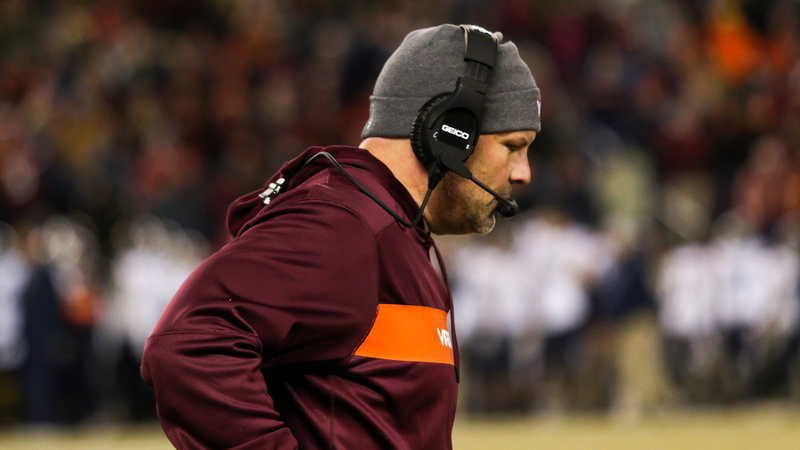 In Lane Stadium this season, Virginia Tech's scoring margin in the third frame against FBS opponents is -74. Which player should the Hokie faithful pay attention to? Going against the grain a little bit, Hokie fans should pay attention to the entire Marshall wide receiver corps. From the five wide receivers listed on their depth chart, Marshall has amassed 1,874 receiving yards. "I'm extremely impressed by their football team," noted Foster. "Doc Holliday has done a tremendous job there since he's been there. They've been a winning program since he's been there, highly competitive program. Right now, dynamic skill kids. Really good running backs that have great balance, good quickness. Dependable, can catch the ball, block. Their strength of their offense is their receivers. Eight [Tyre Brady] is a dynamic football player. But he's one of several. In a lot of ways, they remind me of North Carolina a couple years ago when they had Switzer and a couple of their bigger receivers. That's who they remind me of, as far as their speed. They have a couple guys that can take it to the house, they've got some long receivers that can body a DB and make a tough catch. I just think they're an extremely talented group. We're going to have to play great defense to keep these guys in check. We've got our hands full. This is really talented football team, I know they're going to come in here with a chip on their shoulders, but they bottom line for us is we've got to continue to build on what we did this past week. I appreciate how our kids have come to work every day, but we've got to come to work and really have a great week of preparation as we move forward this week to get ready for Marshall." To hear that Marshall has big and fast wide receivers is concerning. The Virginia Tech secondary has dropped the ball multiple times in pass coverage this year. Luckily for them, so have the opposing wide receivers. The former can't continue to happen. Marshall is a good football team, but the Virginia Tech coaching staff is sure to get this team ready for the challenge. The Hokies got fired up for a chance to extend one streak last Friday. They have another chance to extend another streak on Saturday. Playing a makeup game is a weird scenario. But the Hokies should be flying all over the field. "We've still got a streak to keep alive," said Belmar. "25 straight bowl games. We've still got the mindset that we all want to go out there and attack it as any other game and hopefully come out of it with a W and go on to the 25 straight bowl games." The common theme for this question the past few weeks had been simple. Don't pick the Hokies to win at home until they beat an FBS team in Blacksburg. But they did the dang thing last week. Give me the Hokies, give me the bowl streak living another year, and give me a happy end to the regular season. We can't just ignore that Tre plays pickup to 10 instead of 11 or 21 with skunk rules in place if you get up 7-0. Absurd! With not even a full season under his belt, Hollifield has already won over the Hokie Nation. Moments like gesturing for UVA quarterback Bryce Perkins to get off the field have done the trick. WOW, I totally missed that! I see the GIF, but can someone provide some context? Did he get flagged for that? 3rd down stop. Took it from Luther Maddy who did something similar against UVA years ago. No flag. Someone tweeted it before the game. Might have been Maddy. Regardless I bet Dax picked up on it. I'm pretty sure Dax explicitly stated he was inspired by Maddy doing it. Looking at Marshall's record their victories were against teams with a combined record of 41 wins 54 losses. Only 2 of those teams had a winning record with one of those two being a FCS team. If the Hokies drop this game they truly don't belong in a bowl game. I think we concluded several weeks ago that we really don't belong in a bowl game. That's why we play the game. Whenever I hear about our guys playing pick basketball, I have Antone Exum flashbacks. VT-3.5 .... I want to lay the points with tech, I just don't trust this team this year. That is why it is called gambling and not sure-thing. Tease it with whatever the Bama line is. Somehow I see VT winning big.. Hokies 34.. Herd 21 . I just feel like last week's game might have jellied this bunch more than anything. I will be there . Turner reminds me of another #11 we had at WR , D. Roberts . Turner seems like more of a natural receiver than Dyrell Roberts was. Let's be greedy and hope he ends up being closer to Isaiah Ford. He resembles Kevin Durant to me, at least when Durant was back in college. Did not know Eli Adams played last week. Thankful for the new redshirt rule. With all the extraneous circumstances, I'm glad to have a home game in December...but let's not make a habit of it. Virginia Tech's scoring margin in the third frame against FBS opponents is -74. This feels like the most non-VT part of this entire season. Offensive struggles? Yep that's us. D playing aggressive and giving up the occasional big play? Yep, that's us. Having 0 defense in the 3rd quarter? Nope. That's not us.